Landscaping is one of the best ways to improve your curb appeal and add a fresh, clean look to your yard. There are thousands of possibilities when it comes to deciding how you want to landscape. If you’re considering adding some updated landscaping to your yard, we’ll provide you with some great landscaping ideas to guide you in your decisions. The first thing you want to determine is where you’ll be landscaping. The location of landscaping will determine what techniques and supplies you’ll need to properly do the job. You’ll also want to consider any budgetary limitations right from the start, so that you make sure you can properly afford your landscaping ideas and goals. Take into consideration you natural weather patterns, as you’ll want to make sure you landscape with the proper supplies and plants that will stay as nice as possible. The front yard is one of the most important parts of your home. You want your landscaping to be warm and inviting to friends and family who visit. It’s important to take a look at your front yard and assess what needs to be done. Would a simple upgrade to the walkway or path make a difference or it it in need of more upgrades such as flowers or fencing? We all remember the quaint, welcoming cottages that were in fairy tales. This is a landscape design you can easily incorporate into your front yard with a few changes and upgrades. This look works best for Cape Cod or Ranch style homes. Installing a short, white picket fence with a gate and a path that leads straight to your front door will make your home appear like it’s straight out of a fairytale store. Keeping a well manicured lawn with sharp lines and neatly trimmed hedges, and lots of pretty pink, purple and blue flowers will finish off this fairytale effect. 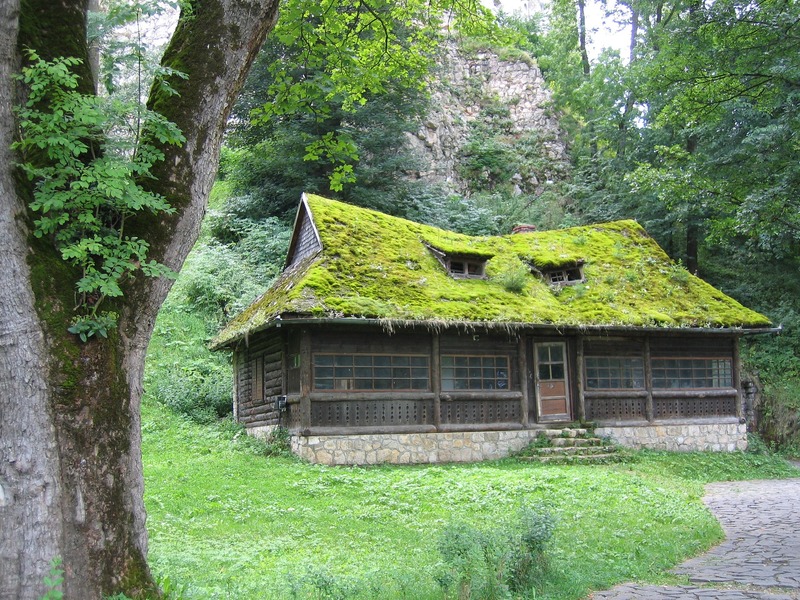 If your house is in a naturally wooded area, embrace this natural beauty! Many homeowners choose to cut trees down and start fresh with new landscaping. If you’re looking for easy-to-maintain trees to plant, evergreens are a great choice. They provide lush greenery year-round and require very little maintenance. Use sand-toned pavers to add a woodsy feel to your front walk and plant flowers such as prim roses, daisies, and a mix of grasses. Dark reds, rich yellows and vibrant greens will serve as a beautiful accent against the backdrop of your home. Simplicity is everything! Our eyes perceive symmetry to be pleasing. Planting similar foliage in a consistent pattern will give your home a polished and professional look. Find an antique wrought iron gate to install at the front of your property and use this as a focal point to plant your vegetation around. If you live in a colonial or traditional style home, you’ll find these landscaping ideas to be particularly flattering to your front yard. If you live in an area with a more neutral colored landscape, flowers are a great way of adding a pop of color to your front yard. Neighborhoods in desert environments tend to have homes with sand colored siding. Plant beds filled with a variety of colorful plants and greenery that will add diversity to your landscape. 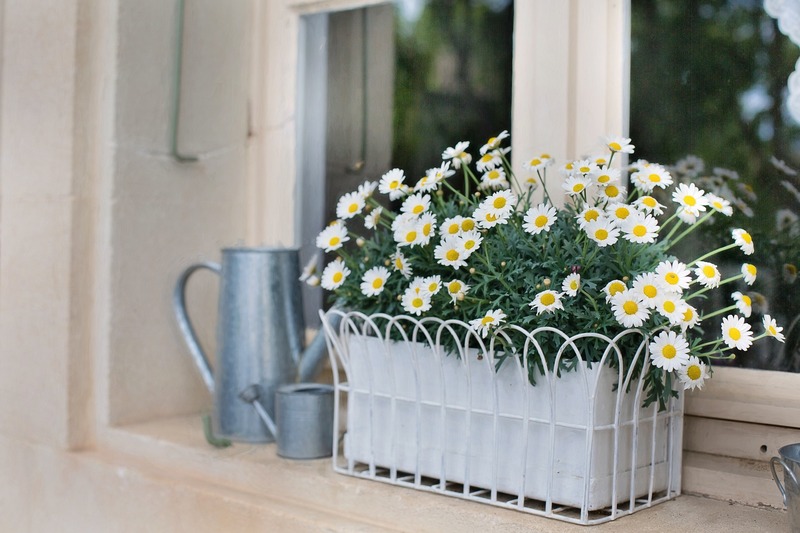 If you don’t have a lot of yard space, adding flower boxes to the front of your home can have a similar effect. Many homeowners want to find a way to have minimal upkeep on their landscaping. They lead busy lives and don’t have a lot of time to invest in yard work. Planting tall-growing ferns such as ostrich ferns, green grasses and lush bushes will create a lush, whimsical look for your front yard. It will look soft and inviting to your guests and require less maintenance than flowerbeds full of flowers. Designing your backyard landscaping can transform a space from an average backyard to a space that feels like your own. Don’t feel the need to transform your entire backyard space. Instead, focus on completing an area to feel like a cohesive, usable space that works together. 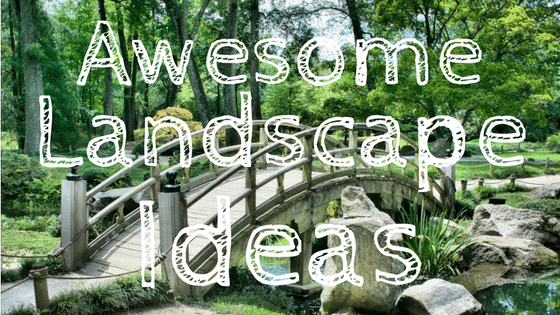 Check out some of our favorite backyard landscaping ideas! Adding a water feature such as a pond or fountain can instantly add a feeling of class and luxury to your backyard. You’ll love sitting on your back patio, sipping a glass of wine as you listen to your water feature trickle peacefully in the background. You can choose to go as large or small with this concept as you want. 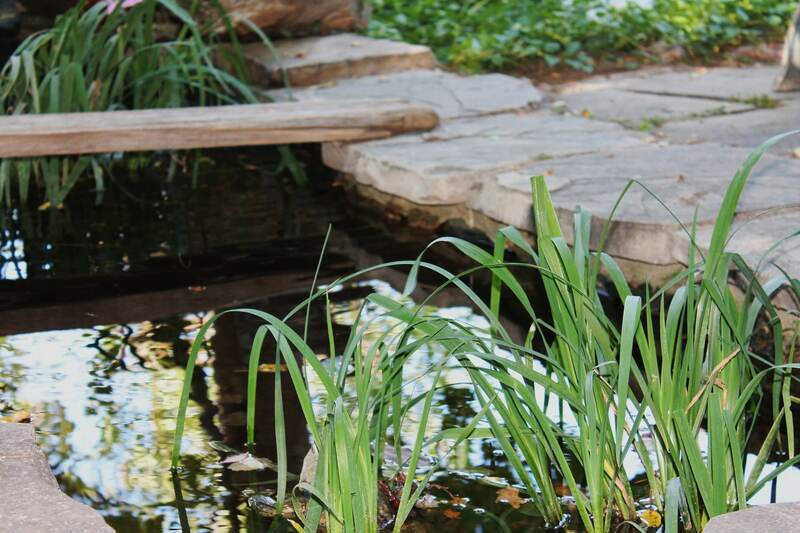 A small pond is a great way to add a focus-feature to your backyard. You’ll notice how small frogs and other wildlife love to gather around the water source. If you have a sizeable backyard, consider creating separate spaces for children and adults to gather. In the children’s area, add a small sandbox or climbing gym. Use the adult’s area to add seating and raised garden beds. If you’re looking to give your space a little extra style, consider built-in seating and plant fresh herbs in the beds surrounding the area. Your guests will enjoy the scent of the herbs in the air as you socialize in your backyard. A courtyard landscape design works best with a level backyard. Carve paths with loose stone and line with bricks to create a manicured look. Add a bird bath and a variety of plants to complete the design. If you plan on spending time in the courtyard, you might want to consider adding a small stone bench or wrought iron chairs to complete the design. You can use this courtyard design to create a variety of different spaces in your backyard. Don’t view your sloped backyard as a negative feature. Instead, embrace the potential it has! Add visual interest to your backyard with a variety of easy-to-grow foliage like azaleas, lilacs or butterfly bushes. 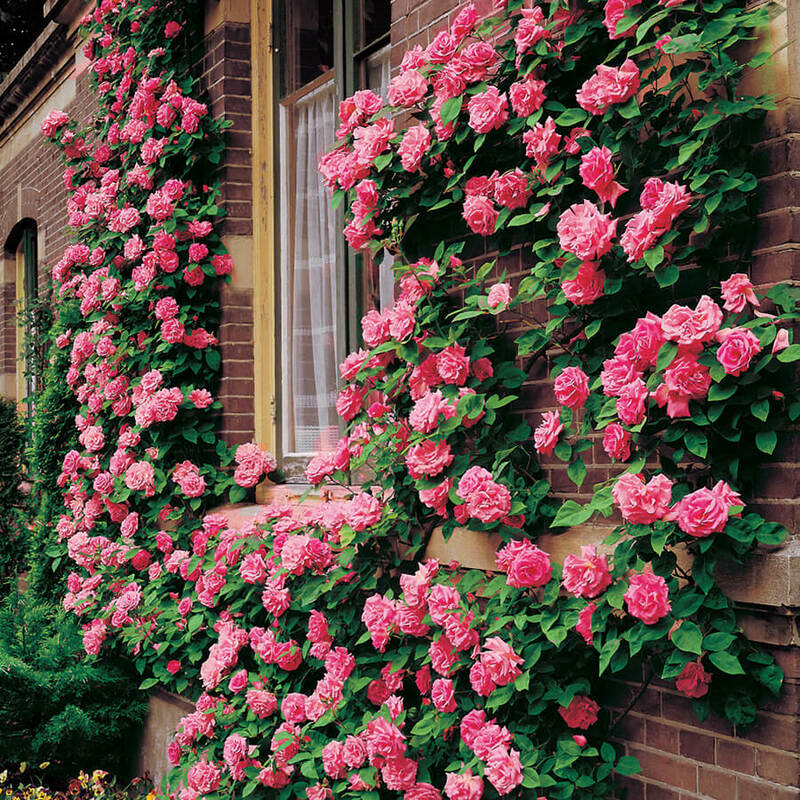 Rose bushes are also a particularly beautiful flower that does well in a variety of landscapes. Consider adding paths to wind through your flowers, allowing for a tranquil stroll through your backyard. Are you looking to spruce up your yard with some new landscaping ideas but don’t have the money in the bank to fund a large project? There’s plenty of small steps you can make to improve your existing landscaping. If you’re a DIY-er, your possibilities are endless. Before you make any changes, take a good look at your yard and identify the points you want to improve. Ask yourself why you think they need improvement and consider what you might like to do. Use this as your guide when you research potential ideas. Often, the difference between a hum-drum backyard and one that people see as beautiful is the existence of a focal point. The human eye constantly seeks a natural point to focus on. Once this is found, it’s easier to appreciate other things that are surrounding. Adding edging around trees and flower beds will add immediate interest to your backyard. You can plant small flowers in the edging, or just add mulching for a contrast. 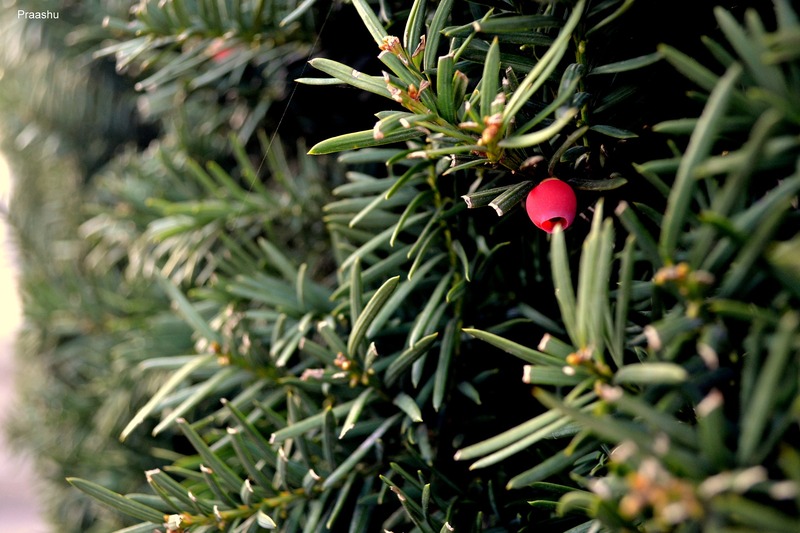 Evergreens are a great way to add some long-term beauty to your yard. They’re inexpensive to purchase and will give a beautiful, full, green color to your yard year-round. Varieties of evergreen shrubs such as boxwoods are also a beautiful way to add some low-level foliage. Don’t feel like you need to fill your entire yard with flowers and plants. Pick a sunny spot and design a small bed in that one area. This will require less maintenance and be easier on your wallet. Island-style beds in the center of a yard are particularly beautiful. Plant foliage of varying heights to add interest and dimension to the bed. Rocks are a great, inexpensive way to add a little interest to your yard. Use rocks and stones of varying size or shape to line pathways, flower beds, and trees. Just be sure they are out of any grassy areas so you don’t damage your lawn mower. Use rocks in colors and shades that are complementary and that look natural in your outdoor landscape. Everybody loves some soft, outdoor twinkle lights! These are inexpensive and easy to install in a variety of ways around your outdoor patio. Wrap them around trees or bushes, or string them across the yard to add a cozy glow to your backyard. Be sure to purchase soft-tinted bulbs to keep the space looking warm and welcoming. Landscaping ideas don’t have to be filled with big changes. Often, simple little improvements and intentional design decisions will make a huge difference in the appearance of your landscaping. If you’re planting flowers, choose varieties with contrasting colors. Deeper, richer shades like plum purple, burgundy and dark greens are great to use as background tones. Contrast these with yellow, white, and bright pinks and purple shades. This will add dimension to your flowers, as well as adding visual interest with the color contrasts. We’ve passed the age of making everything uniform. Instead, enjoy the idea of playing with different textures, patterns and materials. 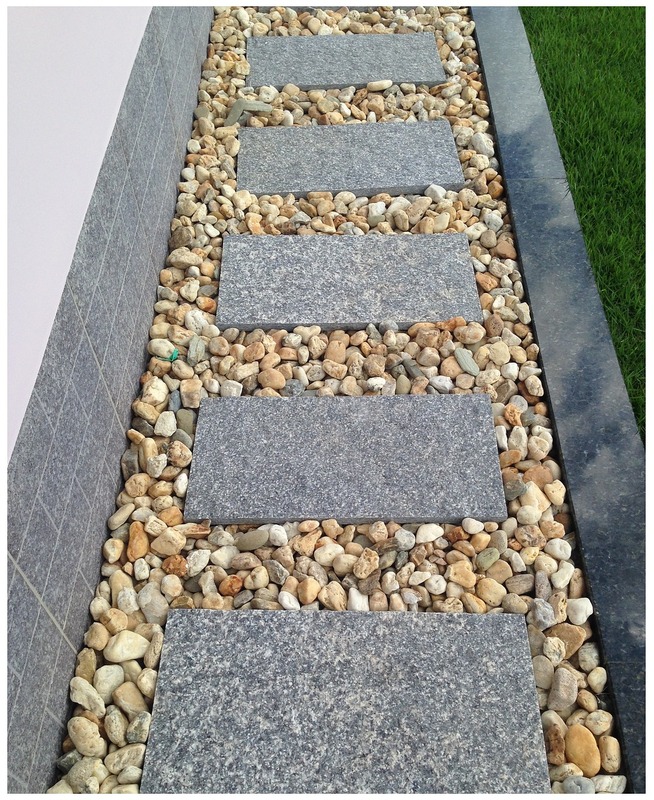 Combine pebbles with flagstone, or gravel with bricks to create paths or line specific areas of your yard. This will add a beautiful eclectic feel to your backyard and give it a unique and original design. You can instantly add color and dimension to your yard with pots and planters. This is a great way to cover up unsightly holes or damage anywhere around your yard. You can purchase planters in a variety of sizes and shapes. This gives you creative license to design the planters however you like. Mulch is one of the simplest ways to make your yard look more polished and professional. A small amount of weeding and a generous portion of mulch will add contrast to your beds. It’s best to find a naturally dyed mulch to avoid harmful chemicals saturating your plants and yard. You can purchase it in a variety of colors and shades. It’s best to choose a shade that complements your natural landscape. Lavender is a beautiful, soft, option to fill various parts of your yard. It’s a lovely purple shade and smells wonderful. It requires very little maintenance and will grow back every year. Another bonus is that it’s a natural insect repellant. 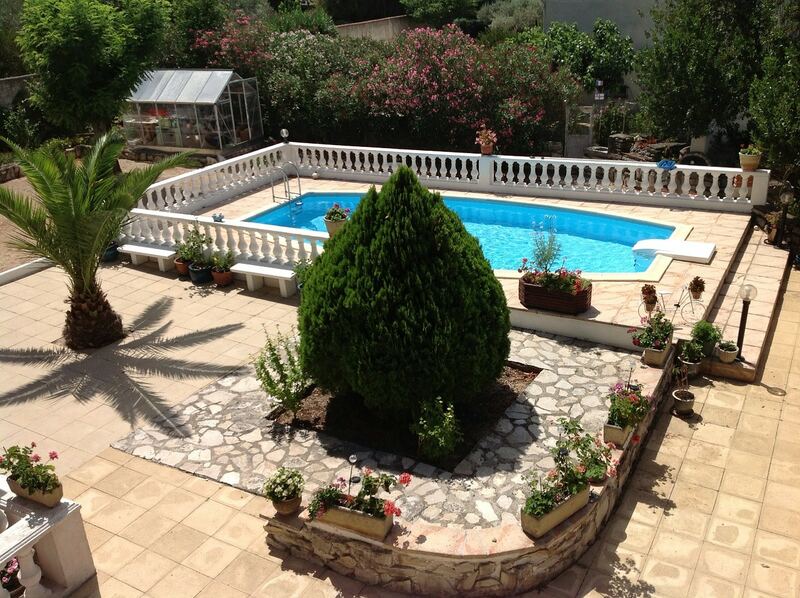 You can enjoy some time in your lovely backyard without being eaten alive by mosquitos! Perennials are great because you plant them once and they come back year after year as long as you take good care of them. Do your research and purchase a variety that will grow best in your terrain. If you live somewhere with rocky soil, plants like hens-and-chicks or yuccas will work well. In wetter climates, you could consider rhododendron or daffodils. Stone is a great way to add a natural look to your landscaping. It’s versatile, cheap and is a great way to add texture and contrast. Different types of stone will create a different look and feel to your landscaping. If you’re looking to add warmth, use river rocks or beach pebbles. The soft, round shape is visually appealing and will create a welcoming space. If your backyard has more of a minimalistic, modern feel, consider more extravagant stones like black lava rock. This adds a pop of contrast to a green space. It’s especially flattering in city yards and patios. If you live in a tropical area, use terracotta stones to create paths and add visual interest. The warm red hues will remind you of the beach. Keep in mind, whatever you choose, you’ll want to make sure you’re happy with the design. It might be good to bring in a few different options before deciding on something. Rocks are great for landscaping because they require no maintenance and will stay in excellent condition for many years, despite weather changes. There are many different options when it comes to pool landscaping. You’ll want to choose a design that matches the area you live in, as well as your backyard landscaping. As we mentioned earlier, symmetry is pleasing to the eye. Consider mirroring your designs on both sides of your pool. Use potted plants and small flower beds to create a framed look around your pool. It will make your pool the center of attention while making the area surround it, pleasing to the eye. If you have the budget and the time, create a tropical oasis-feel around your pool. Plant a wide variety of foliage such as palm trees, and tropical fruit trees. Dwarf mondo grass is a great way to add a tropical ground cover that requires little maintenance. Remember, whatever you choose needs to be best for the area you live in. If you don’t have tropical temperatures, you’ll want to opt for foliage that will still create that jungle-like setting without the requirement for hot, humid weather. Small backyards sometimes get a bad rep for being useless and squelching possibilities. This doesn’t have to be the case! With a few small improvements, you can turn your small backyard into a beautiful, welcoming space. Fire pits are a great way to add both usable space and visual interest to your backyard. Gathering around a fire with a cold brew and a few good friends is one of the best ways to spend a summer night. You can easily build your own circular firepit with bricks or cement blocks. This is also a great way to extend the use of your backyard to multiple seasons! 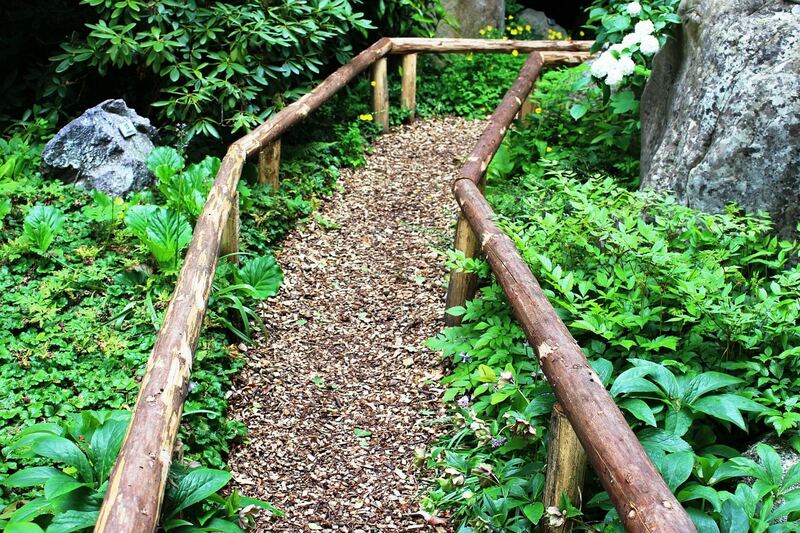 Woodchips are a great way to create useful paths between areas of your yard. Add a small path between your patio and the shed, or between your flower beds. They’re inexpensive and versatile to use in whatever way you choose. Embrace your small backyard and capitalize on the cozy factor. Add quaint, homey seating and utilize small accent tables with potted plants. Surround the space with a short picket or iron fence to make the space look intentionally small. Bamboo rolls are a great way to add an asian-theme to your backyard. Combine them with dark lattice to make your small space feel more tailored and intimate. If you live in an area of the country where water is scarce and temperatures are high, you might not have the option of having a yard full of lush green grass. Add pavers and gravel to create paths, and surround them with drought-hardy grasses and varieties of cactus. Succulents are trendy and a great option for these type of climates. If you do have grass but don’t want to spend too many gallons watering it every day, use large pavers to eliminate most of the grass. Keep patches of grass that will accentuate the design of your home and add visual interest. This will keep your watering needs to a minimum while still giving you that nice green appeal. Landscape timbers are a great way to line your flower or vegetable beds. They’re inexpensive and easy to install yourself with a short tutorial. You can also use landscape timbers to edge out specific areas of your yard such as a patio, child’s play area, or sandbox. Just make sure the timbers are properly anchored to keep everyone safe. If you’re still feeling lost as to how in the world to plan and design your new landscaping, there’s good news! With the rise of modern technology comes landscaping design software! One option is called Plan-A-Garden which gives you the ability to physically design your landscaping by dragging and dropping different landscape elements onto the screen. There are many other free tools available as well, it’s just a matter of finding the one that works best for what you need. Once you’re ready to begin your landscaping, you’ll want to find a local spot to purchase the supplies you need. Many of these locations have employees who are very knowledgeable and can help guide you to make sure you purchase the right supplies. Home Depot and Lowes are two national chain locations where you can buy a wide variety of landscaping materials. Check out your local hardware or outdoor store as well to see what sort of options they might have for you. Developing a landscape design is an exciting task with a wonderful reward. Take your time in thinking through what you want out of your yard. As yourself if you prefer design and appearance over function, or if you’re more interested in a usable space that you can entertain with. Answering these questions will be very helpful as you move through the design process. Enjoy the process and the final product as you gaze over your newly landscaped yard!